Sat., Dec. 2, 2017, 9:34 p.m.
Shaking off a blowout loss to Auburn just three weeks ago, Jake Fromm threw two touchdown passes and No. 6 Georgia made its bid for a spot in the College Football Playoff with a 28-7 victory over the No. 4 Tigers in the Southeastern Conference championship game Saturday. Auburn (10-3) was the hottest team in the country, rolling into Atlanta after wins over Georgia and then-No. 1 Alabama in its last three games. But the Tigers were stymied by two crucial turnovers, a blocked field goal and a Georgia team eager to make up for its embarrassing 40-17 loss on the Plains. Nick Chubb, Sony Michel and freshman D’Andre Swift provided a much more effective running game for Georgia than the first meeting, which opened up things for the freshman quarterback. Fromm completed 16 of 22 passes for 183 yards, including a 2-yard touchdown to Isaac Nauta in the second quarter and a 6-yarder to Terry Godwin with just over 13 minutes remaining that essentially sealed Georgia’s victory. 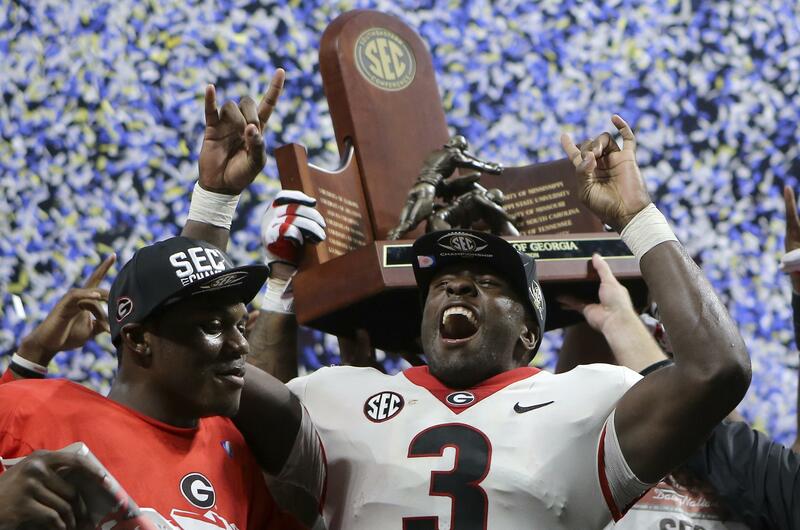 The Bulldogs claimed their first SEC title since 2005 and capped an impressive rise in Kirby Smart’s second season as coach. Georgia went 8-5 a year ago, but Nick Saban’s former defensive coordinator insisted he was establishing a culture that would return the team to national prominence. Georgia (12-1), which was No. 6 in the latest CFP standings, is likely to move into the top four after its dominating performance against the Tigers. Auburn was ranked second in the CFP poll but managed only 259 yards after piling up 488 in the Nov. 11 rout. (1) Clemson 38, (7) Miami 3: Clemson emphatically claimed its spot in the College Football Playoff as the Tigers (12-1, No. 1 CFP) rolled over the Hurricanes (10-2, No. 7 CFP) in Charlotte, North Carolina. Kelly Bryant set a championship game record – and surpassed his friend and former teammate Deshaun Watson’s mark of 13 – by completing his first 15 passes and finished with 252 yards passing and a 27-yard TD pass to Deon Cain on the way to Clemson’s third straight ACC crown. Bryant had one of Clemson’s four rushing touchdowns and the Tigers defense made it stand up against a Hurricanes team that has been spurred on to its turnaround season by their glitzy, bling-covered “Turnover Chain” – jewelry worn by any Miami player with a pick or a fumble. Instead, it was the Tigers who won the turnover battle (3 to 1) and held Miami to its fewest points and yards of the season to spoil the Hurricanes’ first appearance in the contest since the one-time powerhouse joined the league in 2004. (2) Oklahoma 41, (10) TCU 17: Baker Mayfield threw four touchdown passes and the Sooners (12-1, No. 3 CFP) staked claim to a playoff spot with a resounding victory over the Horned Frogs (10-3, No. 11) in Arlington, Texas. With their record 11th Big 12 title, the Sooners are a lock to get in the College Football Playoff for the second time in three seasons. They are the only Big 12 team to make the four-team playoff format that started in 2014. Oklahoma jumped out to a 17-0 lead, including Caleb Kelly’s 18-yard fumble return for a touchdown after running back Kyle Hicks’ turnover on the first offensive play by TCU. Kenny Hill threw two TD passes to get the Horned Frogs to 24-17 at halftime, but Oklahoma scored twice on its first three offensive plays after the break. Mayfield, considered among the front-runners for the Heisman Trophy to be named next week, was 15 of 23 for 243 yards to take game MVP honors. The first two touchdown passes were to tight end Mark Andrews. On fourth-and-1 from the Oklahoma 41 on the next drive, Hill bootlegged to the right side. Big defensive end Ogbonnia Okoronkwo chased him toward the sideline before Parnell Motley delivered the crushing blow that kept TCU’s quarterback from getting a first down. Two plays later, Marquise Brown made an over-the-shoulder grab for a 52-yard TD strike and a 38-17 lead. (8) Ohio State 27, (3) Wisconsin 21: Six days after having surgery on his right knee, J.T. Barrett threw two touchdown passes, ran for another and had a crucial fourth-down conversion late in the game to give the Buckeyes (11-2, No. 8 CFP) a victory over the Badgers (12-1, No. 3 CFP) in the Big Ten championship game at Indianapolis. Ohio State (11-2) claimed its first conference crown since its 2014 national championship season. The loss ended the nation’s longest active winning streak at 13 and probably doomed the playoff hopes of the Badgers (12-1). Barrett finished 12 of 26 with 211 yards, two TDs, two interceptions and rushed 19 times for 60 yards. (12) UCF 62, (16) Memphis 55 (2OT): Otis Anderson scored on a 1-yard run on the first possession of the second overtime and the Knights (12-0, CFP No. 15) – in what turned out to be their last game under coach Scott Frost beat the Tigers (10-2, CFP No. 20) in Orlando, Florida, for third AAC crown in five years. Frost, the second-year coach and former Nebraska quarterback, took the Cornhuskers’ job after the game. Memphis got as far as the UCF 9 in the second OT, but Riley Ferguson’s pass on second-and-goal was intercepted by Tre Neal, giving the Knights a likely spot in a New Year’s Six bowl. The top two scoring teams in the country combined for 117 points and 1,479 yards. It was tied at 48 at the end of regulation. The Knights led 48-34 early in the fourth quarter but the Tigers rallied to tie with 4:13 remaining on Ferguson’s 10-yard touchdown pass to Anthony Miller. Memphis had a chance to win it in regulation but Riley Patterson’s 51-yard field-goal attempt with 28 seconds remaining was wide left. UCF’s McKenzie Milton was 28 of 40 for 494 yards and five touchdowns. He was selected the game’s most outstanding player. Boise State 17, (25) Fresno State 14: Brett Rypien threw for 246 yards and led a fourth-quarter comeback to help Boise State beat Fresno State in the Mountain West championship game in Boise. Fresno State (9-4), which hasn’t won in Boise since 1984, still completed one of the best turnarounds in college history under first-year coach Jeff Tedford after going 1-11 a year ago. Boise State had only mustered 103 yards of offense on its first four possessions of the second half until the Broncos broke out. Rypien, a Shadle Park alum, hit Cedrick Wilson on a 59-yard pass play to the Fresno State 36. After a pass interference call in the end zone put the ball at the 2, Ryan Wolpin, filling in for injured starting running back Alexander Mattison, powered his way into the end zone. Fresno State had two more possessions, but failed to get a first down. Marcus McMaryion’s final pass was intercepted by Leighton Vander Esch. Florida Atlantic 41, North Texas 17: Devin Singletary ran for 164 yards and three touchdowns and the Owls defeated the Eagles in Boca Raton, Florida, to win their first Conference USA championship in coach Lane Kiffin’s first season. The Owls (10-3) extended their unbeaten streak to nine games and were undefeated against C-USA opponents this season. Jason Driskel completed 15 of 27 passes for 269 yards and a touchdown, and Kalib Woods had a school-record 208 yards receiving yards. FAU had 633 yards of offense. The Owls, who beat North Texas (9-4) 69-31 in the regular season, took a 34-0 lead in the first 33 minutes. FAU had gains of 47, 49, 22, 44, 21 and 34 yards in the first quarter alone. Toledo 45, Akron 28: Logan Woodside threw four touchdown passes, Terry Swanson ran for 180 yards and two scores and the Rockets defeated the Zips at Ford Field in Detroit. Receivers Diontae Johnson (118 yards) and Jon’Vea Johnson (103) combined for 221 yards and three touchdowns for Toledo (11-2). The Rockets won their third conference title game and first since 2004. Akron (7-6) forced five turnovers but couldn’t overcome a lopsided first half in it second loss to Toledo (11-2) this season. Woodside threw three touchdown passes in the first half, two to Diontae Johnson, as help the Rockets take a 28-0 lead. Published: Dec. 2, 2017, 9:34 p.m.